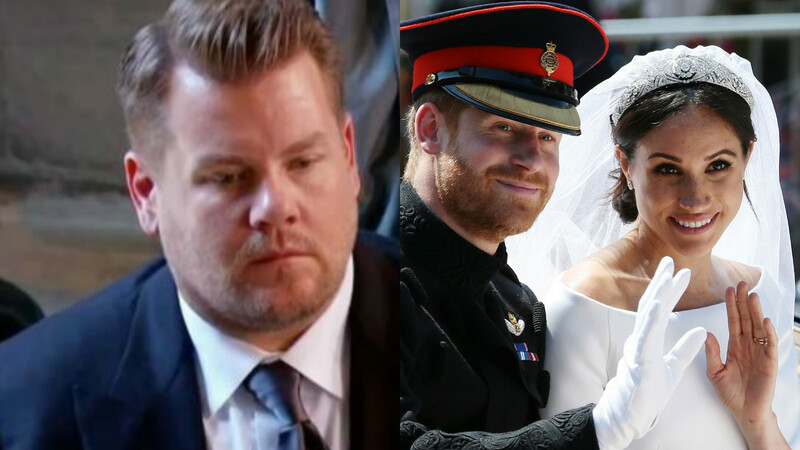 James Corden was one of many big stars to appear at the Royal Wedding, but he didn't seem that happy about it at the time. However, there was a reason for his "resting Royal Wedding face". He was trying to stifle a bout of sneezes. Speaking on his Late Late Show, James revealed just why he seemed a tad miserable in some shots during the wedding of Prince Harry and Meghan Markle at St George's Chapel on Saturday (May 19). "I couldn't have been having a better time," he said. "But here's the thing, the worst part of the ceremony for me was there was flowers everywhere. The most beautiful flowers you've ever seen. "And I get quite bad allergies if I'm in close proximity to flowers so for a lot of the ceremony I just needed to sneeze. "I was like, 'Please don't sneeze,' and I had to do one of those internal sneezes... I think I got away with it." Thankfully, James managed to stifle his sneezes, and the wedding wasn't interrupted in the most embarrassing way for the talk show host. "It was gorgeous, the whole affair," he added. "It was happy, it was joyous, it was up-lifting. "It was Britain at its finest – a picture-perfect day, Windsor Castle, six hundred guests, 30,000 flowers or as Elton John calls it, a Thursday." Sir Elton John, George and Amal Clooney, Victoria and David Beckham and Oprah Winfrey were also among the famous faces who attended the wedding. Meanwhile, the couple are said to have danced to a Whitney Houston classic for their first dance, while Sir Elton John performed a couple of hits earlier in the day.